Your smile isn't like anyone else's. 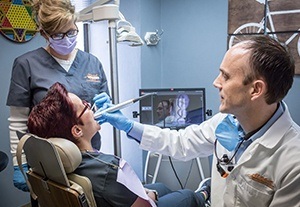 With that in mind, Oklahoma City dentist, Dr. Brad Mitchell, and his team of dental hygienists and assistants strive to provide patients just like you with personalized oral care every day. With our range of general, cosmetic, and restorative dentistry services, we're confident we can meet your family's diverse dental needs. From oral checkups and cleanings to teeth whitening, porcelain veneers, and dental implants, we can help you attain your ideal smile. At every appointment, Dr. Mitchell will perform a thorough oral exam to determine how you're doing and to assess your needs. Afterwards, he's happy to discuss all your dental treatment options and answer any questions you might have. Rare is the person who goes through life without needing any restorative dental care. For example, as the years pass, our teeth age just as the rest of the body does. Consequently, your teeth may succumb to a number of different problems, from decay to injury. A cavity, for example, can now be repaired with a tooth-colored filling, so no one but you and Dr. Mitchell will ever know. We use composite resin material that is custom blended to match the natural color of your tooth. Oklahoma City dentist, Dr. Mitchell, will carefully create your treatment plan based on the results of an extensive oral exam. We'll finish your appointment by explaining your options and listening to any questions or concerns you might have. We never want to move forward on any treatment plan unless the patient is fully comfortable with what we propose. Your comfort and safety are top priorities for us. Dr. Mitchell's goal is pain-free dentistry. He will do anything and everything he can to achieve this goal and make your dental visit as easy and smooth as possible. Do you want to schedule an appointment with Dr. Mitchell? Call our Oklahoma City dental office today at (405) 755-2670 to reserve your visit. We look forward to serving your entire family.